Gli accessori, grazie alla loro qualità, design ed ergonomia, sono perfettamente compatibili con il portaplacche e il cinturone MOLLE. 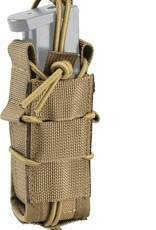 The PA pouch can be fixed on any MOLLE system. The pouch has been designed to respond to be compatible with most of the pistols chargers. 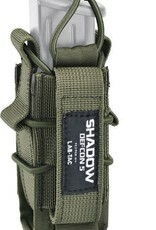 The pouch may also contain flashlights, knives, multifunctional pliers etc. The rubber band with the sewn tab, positioned on the top of the pouch, offers an additional security during the transportation, making the pouch compatible for TAP units – it is rapidly detachable. The accessories, thanks to their quality, design and ergonomics, are perfectly compatible with the plates folder and the MOLLE belt.